Kit Fisto is a Star Wars minifigure, and is a depiction of the Jedi Master of the same name. Kit Fisto has appeared in two sets and is due to appear in another later this year. His first physical appearance was in 2007 which was 7661 Jedi Starfighter with Hyperdrive Booster Ring, the second being the 8088 ARC-170 Starfighter, and the third being 9526 Palpatine's Arrest. He has appeared in all three released LEGO Star Wars video games. Fisto also appears in the game, LEGO Star Wars III: The Clone Wars. The minifigure is one of three Star Wars characters to have a rubber-mould head, the others being Plo Koon and Star Wars: The Clone Wars version of Yoda. This head is has multiple tentacles behind the back of the Minifigure's torso, with two larger ones in front. His head is sand-green coloured with brown markings around the side of the head, and black eyes and mouth. The torso piece is a brown outer Jedi tunic, with a grey one underneath, along with a grey coloured belt. The hands are sand-green to match the colour of Fisto's skin. His legs, like his tunic, are brown. In all of his appearances (both physical and video game), Kit has come with only one accessory- a green-bladed lightsaber. However, in 7661 Jedi Starfighter with Hyperdrive Booster Ring, the lightsaber hilt was a plain light grey and in the 8088 ARC-170 Starfighter, it was in a chrome silver form. 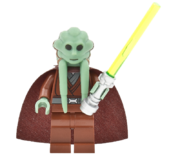 He appears in this version once again in the 852947 Kit Fisto Magnet Set. Kit Fisto was again released in 9526 Palpatine's Arrest, with a green-bladed lightsaber, with the blade in the new transparent green colour, and also wears a brown cape. In LEGO Star Wars: The Video Game, LEGO Star Wars II: The Original Trilogy and LEGO Star Wars: The Complete Saga, Kit appears in a different form to his physical minifigure. In the games, Kit's head is of a standard minifigure's, but features an additional piece on top of this for his tentacles, in a similar fashion to the way that the Aayla Secura minifigure is constructed. Note that his front tentacles are shorter in the video game than his actual minifigure. Another difference to the head piece was that it doesn't have the brown "band" on the tentacles. Fisto's torso is similar in design to Obi-Wan Kenobi's Episode III torso piece, which features Jedi robes, and his leg piece is brown. He also wears a cape. Kit's weapon in the games is a green-bladed lightsaber. Kit Fisto as he appeared in LEGO Star Wars III: The Clone Wars. In LEGO Star Wars: The Video Game, Kit could be a playable character though using the code of "CBR954" at Dexter's Diner, however could be purchased as normal through Dexter's Diner on other versions of the game. Kit Fisto as he appeared in LEGO Star Wars: The Video Game along with Shaak Ti. Kit could again become a playable character in LEGO Star Wars II: The Original Trilogy only after having a save of LEGO Star Wars: The Video Game with him already as a playable character inserted into the console, and the "Use Old save" purchased from the Extras section. In this game, Kit also has the ability to build certain objects like most other non-droid minifigures. In the Playstation 2 version of the game, the player must also additionally collect all ten minikits from Episode V, Chapter 1 in Free Play for Fisto to be playable. Kit Fisto makes an appearance in LEGO Star Wars III: The Clone Wars. This time, the character is based on the physical minifigure's likeness, and is once again he is wielding a green-bladed light saber. Like all Jedi in LEGO Star Wars III, Fisto retains his abilities from previous games, but can also perform a lightsaber throw, cut through walls marked with a Jedi Order logo, and climp up certain walls with his lightsaber. He appears in 2 levels- Battle of Geonosis and Lair of Grievous. Kit Fisto was a Nautolan Jedi Master and General who sat on the Jedi High Council during the Clone Wars. He is known to have trained two Padawans to Knighthood; the second, Nahdar Vebb, was killed by General Grievous during a mission to the third moon of Vassek. Fisto participated in many battles throughout the Clone Wars, including the Battle of Geonosis. Towards the conclusion of the Clone Wars, Fisto was a part of a group of four Jedi led by Mace Windu who went to arrest Supreme Chancellor Palpatine, the Sith Lord Darth Sidious. Sidious quickly cut the others down, with Fisto managing to fend off the Sith's attack briefly before he too was killed, leaving Windu to face Darth Sidious alone. His head is one of three to be made of a particular kind of rubber instead of ABS plastic, the others being Plo Koon and the Clone Wars version of Yoda. This page was last edited on 27 May 2016, at 12:12.